Half of Brazil's population cannot prove full legal ownership of their homes, depriving authorities in the recession-hit country of a major source of taxes and deterring local investment, a senior government official said. An estimated 100 million people lack property rights, a senior Ministry of Cities official told the Thomson Reuters Foundation, highlighting the need for Brazil to bring its housing sector into the formal economy. Title deeds for millions of unregistered homes would provide residents with greater security and investors with more stability, analysts said. The government provided the figures revealing the size of Brazil's informal economy and the lack of property rights after it announced a drive to provide title deeds for tens of millions of Brazilians last month. The program aims to help kick-start economic growth after two years of recession and the loss of two million jobs nationwide. "Once the resident's (property) right is registered it can be pledged as a bank guarantee, increasing access to credit," Silvio Figueiredo, director of urban affairs for Brazil's Ministry of Cities, told the Thomson Reuters Foundation. "A number of benefits are guaranteed from urban land regularization." Figueiredo could not say how much funding has been allocated to the government's title deed program nor could he estimate how many households would benefit. 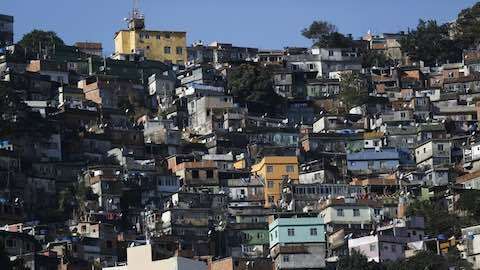 However of the homes lacking full title deeds, officials say that more than 3.6 million are in Brazil's sprawling slums or favelas, which first developed as squatter communities and are home to millions of people. Some urban economists and analysts believe granting title deeds in favelas will help residents break the cycle of poverty by providing security from eviction and encouragement and incentives for investment in improvements and small businesses. "People with insecure tenure are less likely to make investments in the structure they are living in because they are worried they could lose it," Jan Brueckner, a University of California economist told the Thomson Reuters Foundation. Across Brazil, a varied and complex system of informal property ownership has complicated government efforts to provide titles and regularise property ownership, said Vitor Bukvar Fernandes, a University of Campinas researcher who has studied land issues. Some homes in middle class areas, for example, exist in a legally grey area where residents have a bill of sale affording them some security but the properties are not registered with the government and therefore do not exist within the formal title system, he said. "Informality in big cities is rampant," Fernandes told the Thomson Reuters Foundation. Land rights analysts generally support the idea of improving formal property ownership for the urban poor but some question the government's priorities. "Getting formal titles is not a high priority for (favela) residents," said Tais Borges, an urban planner at Massachusetts Institute of Technology (MIT) who has worked with the Brazilian government on property regularization. "The biggest complaints are sewage and parking," she said. The government should focus first on building infrastructure and connecting services for poor communities and then work on regularizing land titles, Borges said. For example, favela communities need postcodes so mail can be delivered and to make it easier for residents to apply for jobs, she said, adding that these basic facilities are needed more than formal property titles. Currently, most favela properties are bought and sold informally - often among friends and neighbours - because they are not officially registered by the government, analysts said. Latin America: "Half of Brazil's Population Lack Full Property Rights"